Doncaster drifted from odds-on prices to 11-10 with RedZone but they had the game sewn up after blitzing Bristol Rovers in a dazzling 30-minute spell. Mallik Wilks had already missed a header before James Coppinger put Donny in front inside three minutes as the veteran's weak shot went straight through visiting goalkeeper Jack Bonham. Wilks then had a shot saved at Bonham's near post, although the hosts were not to be denied a second with Coppinger's effort finding the corner of following some slick football. A Wilks shot was blocked on the line by Tom Lockyer and it seemed only a matter of time before the on-loan Leeds man would notch. That moment came just after the half-hour mark as he turned the defence inside out to finish smartly. It took 33 minutes for the visitors to register an attempt on or off-target and that was a weak header from in-form front man Jonson Clarke-Harris. Kieran Sadlier's shot was blocked as Donny nearly made it four, although the visitors had the better of the exchanges late in the half. Gavin Reilly's curler was well saved, Lockyer just failed to get a proper connection on a scrambled set-piece and Clarke-Harris was unable to make the most of a long punt forward which briefly put him clear. However, any hope the outsiders of building on those moments were quickly exterminated by Sadlier's excellent long-range shot which flew into the top corner. Clarke-Harris pulled back a consolation from the penalty spot and had a strong shout for another turned down but the final shots on target count of 7-7 did not do justice to Donny's dominance. Graham Coughlan ditched his midfield diamond in favour of a 4-3-3 formation, explaining before the game that he was looking to hit attack-minded Doncaster on the break. The theory, Coughlan said, was that Donny would have the majority of possession but sometimes left themselves exposed defensively and his Bristol boys could exploit the gaps. It didn't work, and wasn't helped by them conceding so early. Coughlan seemed to accept his fate and made no substitutions until the 72nd minute. Teenager Deon Moore came on for his league debut, while midfielder Ed Upson was subbed as soon as he was booked as Coughlan took aim at the remaining fixtures rather than trying to launch a comeback. The only tactical change was to swap wingers Alex Jakubiak and Gavin Reilly, who did little to justify their inclusion having not been in the starting 11 for Saturday's 2-2 draw at Plymouth. James Clarke produced a bulldozing run for the penalty, midfielder Ollie Clarke showed a couple of nice touches and Clarke-Harris was a threat on the away team's rare forays forward in an otherwise disappointing display. 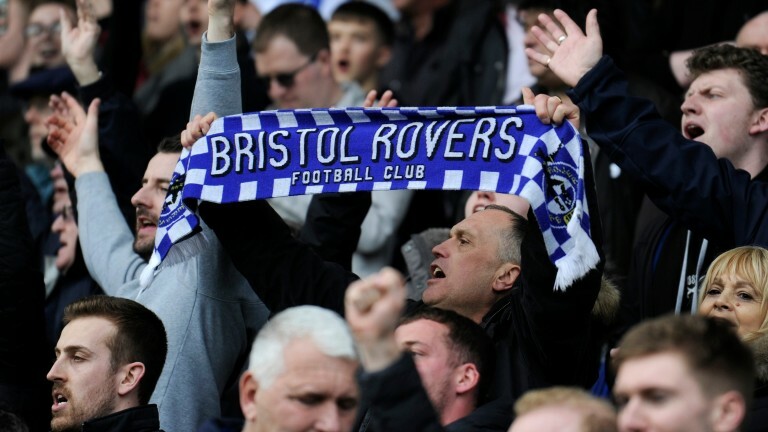 Bristol Rovers were timid throughout, but particularly in the first half when the game was lost. Few of their players came out of the match with any credit, but keeper Bonham made a terrible mess of the first goal and Tareiq Holmes-Dennis was given such a tough time that Coughlan made a mercy call to substitute the left-back to prevent him getting a red card. Clarke-Harris was the standout Gas performer. Sky Bet Championship clubs have reportedly been scouting the former Coventry forward and he has scored eight goals in his last nine matches. At bigger prices Lockyer seemed to be the set-piece target and full-back James Clarke had his moments in the final third. Coughlan said: "It was a surprise that we conceded four but it could have been more. We didn’t lay a glove on them. They were far better than us but the lads have been different class and I'm not going to let one game destroy what we have built up." As Coughlan said, his team had been on a good run with only one defeat (against Sunderland) in ten games prior to this and four clean sheets in their last five, so maybe the Yorkshire trip should be filed under an uncharacteristic bad night. However, if they don't improve the Gas will be blown away by League One leaders Luton before tackling more winnable assignments in the ridiculous relegation battle which sees half of the division battling to stay up. Solely on this evidence 15th-placed Rovers are bang in the mix to go down, although it almost feels too bad to be a true reflection. Doncaster had been in a rough patch but this was a welcome return to form as they moved back into the playoff positions despite the absence of influential midfielders Ben Whiteman and Herbie Kane. They were sharper all over the pitch and Wilks was unplayable at times. He could be important for the remainder of the season as top man John Marquis's goal drought was extended to eight matches. Grant McCann's men are good enough to sustain their top-six push and they are not to be totally discounted, even though they would be the outsiders of four in the playoffs. Doncaster 4-2-3-1: Marosi; Blair, Downing, Butler, Andrew; Crawford, Rowe; Wilks (May 75), Coppinger (Beestin 80), Sadlier (Smith 84); Marquis. Bristol Rovers 4-3-3: Bonham; J Clarke, Lockyer, Craig, Holmes-Dennis (Partington 72); O Clarke, Upson (Sinclair 75), Ogogo; Reilly, Clarke-Harris, Jakubiak (Moore 82). Doncaster 4-2-3-1: Walsall (h), Bradford (a), Plymouth (h). Bristol Rovers 4-3-3: Luton (h), Coventry (a), Bradford (h).